One of our customers has become something of a sloth collector: “I have bought two so far. One was for a nine-year-old and the other was for a 17-year-old. They both love it as much as I did. I'm 50 and would like to buy myself one!” (Mary, Garden City, NY). This mobile brings a lazy touch of storybook style to nurseries and big kid decor alike. A group of tree-hugging sloths hang from plush greenery, creating a relaxing tableau of slow-moving charm. Bright and cheerful, each figure is hand knit by Peruvian artisans. Handmade in Peru. My wife and I are expecting a baby and we had decided that we would decorate the nursery in sloth decor. This was just absolutely perfect and that I found it to give to my wife on Christmas was even better! My daughter is doing her nursery in sloths so this was absolutely perfect. The quality is outstanding. I literally could not be happier. She loved it. This is adorable and well made. It looks so cute hanging in my bathroom! This is adorable and well made. I like that it was made in Peru and I am helping to support the women there. Got this for my sister in law because it was too cute not to! However after seeing it in person it's fairly small and absolutely not worth the cost. It is still cute and not really worth the hassle of returning so I'll give it to her anyway. This was such a beautiful gift. Well made and unusual. And so cute! This is the cutest mobile ever! Sloths! We wanted something unique to complement our upcoming baby's nursery, and it was a no-brainer when we saw this. It is the perfect touch of sweet and original for his nursery, and I love how it benefits women in Peru! It is very well-made, though a little smaller than I thought it would be. Any baby would be lucky to have this - ours certainly is! 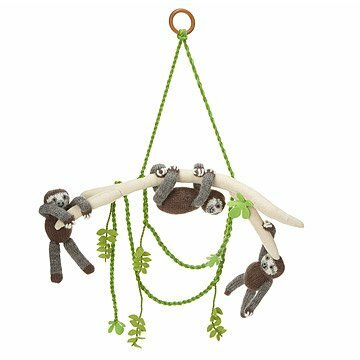 Let your little one enjoy a lazy day in her crib with plush, handmade sloths hanging from branches.